The team - at time being 7 skaters from Central Florida, will skate all night long and both get a great time with friends and at the same time raise money for cancer research. If you can't be there at the event, I hope you will support our efforts by donating to the cause. As little as $5 can be donated and every cent that we can get together the better it is. Hope to see lots of skaters there and lots and lots of money raised! Relay For Life is the American Cancer Society’s signature activity. It offers everyone in a community an opportunity to participate in the fight against cancer. Teams of people camp out at a local high school, park, or fairground and take turns walking or running around a track or path. Each team is asked to have a representative on the track at all times during the event. Relays are an overnight event, up to 18 hours in length. Celebrate. The lives of those who have battled cancer. The strength of survivors inspires others to continue to fight. Remember. Loved ones lost to the disease. 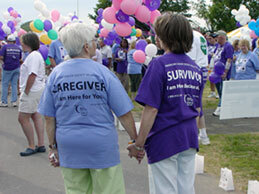 At Relay, people who have walked alongside people battling cancer can grieve and find healing.